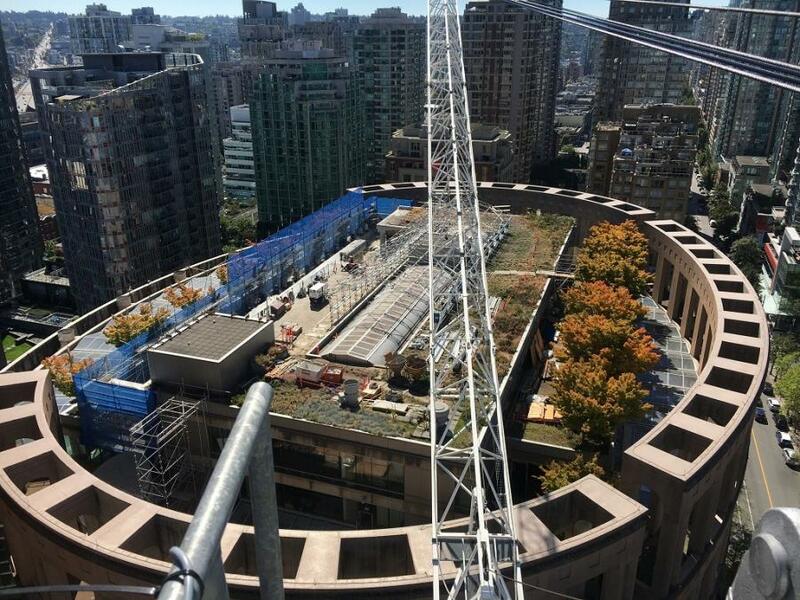 During the demolition and reconstruction of the 8th and 9th floors at the downtown Vancouver Public Library (VPL), Smith Bros. & Wilson (BC) Ltd. (SBW) of Vancouver was tasked with converting the once Provincial government office spaces into additional library space, meeting rooms and an urban green space, all while keeping the library open to thousands of visitors daily. New construction projects always come with a set of challenges, but the site and lifting needs are usually straight forward enough that several different crane options fit the requirements. Building reconstruction, on the other hand, typically comes with its own unique challenges. Often, there are obstacles in the way that make selecting the right crane much more difficult, and bidding the right crane can be the difference between getting the job and moving on to the next opportunity. Demolition and construction activities required many materials, large and small, to be moved. VPL is a very high profile project for the city, as the building's distinct design makes the library a focal point of the downtown area. While the historical look allows it to stand out, it also poses unique challenges that require much preplanning in order to properly bid. “The structure's shape required a minimum of a 600-ton capacity class mobile crane to hoist large materials to and from the upper floors because it would be boom bound,” said Brown. Given the possible set-up locations for a mobile crane at the site, smaller cranes just did not offer capacity to lift many of the objects at the required boom lengths and working radii. “The job required a 180.4-ft. boom radius, and the flat top and hammerhead cranes didn't offer the capacity we needed for the escalators without breaking them down,” said Brown. Plus, there was a more pressing issue, as the crane would be placed about 50 ft. (15.2 m) from an adjacent structure. “Those booms were too long, and they didn't have the freedom to slew without hitting a structure, so these designs were not an option,” said Arsene. “Through our discussions with Leavitt, we calculated the luffing jib as the most economical hoisting logistics solution for us,” said Brown. Steve Filipov, president of Terex Cranes, said the company offers a complete line of tower cranes as part of its lifting solutions because of challenging projects like this. Bidding the job using the CTL 430-24 crane helped SBW receive the contract. For the year-long renovation project, SBW entered into a six-month rental agreement with Leavitt for the 26.5-ton (24-t) class Terex luffing jib tower crane. Its tower required seven HD23 22.6 segments to reach the needed jib base height of 147.6 ft. (45 m). To cover the entire site, the CTL 430-24 was equipped with a 180.4-ft. (55-m) jib. A 15-degree in-service radius was used throughout the project to lift materials to and from the rooftop. “Using the luffing jib allowed us to position the tower closer to the library structure, but, even still, most of our lifts were made close to tip radius of the 180.4-ft. jib,” said Brown. Meticulous planning led to flawless execution of crane installation the weekend of June 10 for Leavitt and SBW. The city allowed the adjacent Homer Street to be closed to facilitate installation. As work transitions to the reconstruction phase, the crane will be used to hoist large building materials and full concrete buckets from street level to the 8th and 9th floors. The largest and heaviest planned lifts will be the two, 12,000-lb. escalators, hoisted into position without disassembly to save time and money. “The plan calls for the escalators to be placed toward the end of the 180.4-ft. jib, and the crane's load chart offers plenty of capacity to position the two pieces,” said Arsene. If all continues to go according to plan, SBW will stop using the Terex luffing jib tower crane at the end of 2017. To further reduce project costs, SBW's plan for the CTL 430-24 crane included a freestanding tower that wasn't tied into the library's structure. Originally, SBW planned on using an undercarriage strut mounting for the tower section. However, the optional base's availability was limited and not available in western Canada. SBW put its century-plus concrete fabrication experience to work and consulted with engineering firm, TNAI Engineering Ltd. of Vancouver, to construct a custom concrete base to serve as a tying point for the crane's tower. TNAI came up with an ingenious way to anchor the crane in a manner that would not require it to be secured directly into the building's foundation. “You don't know what type of utilities and electrical components you will run into when cutting into the membrane, and this could lead to significant expense and delays,” said Arsene. TNAI's engineering team came up with a “floating” 32.8- by 32.8 ft. (10 by 10 m), X-shaped concrete base. “When reviewing the parking lot's drawings, we found columns supporting the library's parking structure that were built at a 32.8- x 32.8-ft. spacing, so we tied directly into those columns,” said Arsene. The columns served as the anchor conduit to the foundation below the parking structure. The concrete anchor measured 6-ft. (1.8-m) wide, and height along most of the cross section was 6.5-ft. (2-m) tall. The outside 4-ft. (1.2-m) end segments of the structure anchoring into the columns were 8.5-ft. (2.6-m) tall. “This, in essence, gave us 2-ft. spacing between the concrete end segments and grade at the center of the X-shape to create the floating base required to properly disperse the load,” said Arsene. By employing the ingenious solution, SBW saved time, lowered costs and allowed the parking structure to remain open during the year-long reconstruction project. For more information about SBW, visit http://smithbroswilson.com/. For more about Leavitt Cranes, visit http://www.leavittcranes.com/.